Today I wanted to share my natural deodorant and no shampoo updates. Earlier this year I posted about finally going no ‘poo. After trying on and off for many years to ditch the store-bought shampoos, I felt like I had finally tackled it and posted my results 18 days in. My no ‘poo method ended up lasting about 4 months, which I think is awesome and my longest success rate thus far. I’m happy to post my unsuccessful results in the end because I know I’m not alone. For a long time my hair felt okay. Here are my thoughts. I think if you live in a city with highly treated water that could have a lot to do with perceived success/fail. All of my attempts to go no ‘poo while in Batavia were extremely unsuccessful. I had hard water where I lived, the kind with a lot of calcium and mineral deposits. The water is also heavily treated. In Portland, the water is from open reservoirs and minimally treated, it’s also where I had the most success. I now live in eastern Washington and I’m back in the Batavia ‘zone’ of water quality except there’s not as many mineral deposits. I don’t subject my hair to a lot as far as styling. I occasionally use hair spray and rarely curl my hair (although I wish I had the patience to do it more often). Blow drying my hair is what I do most but still only a few times a week. The extent of my product use is jojoba and argan oils, but those are nourishing and don’t count. With no ‘poo, I loved how my hair looked when I let it air dry but it was never good on the 2nd day. Never. It became too dry, which never made sense to me. If I blow dried my hair, I could go 2-3 days with great looking hair. You’d think the heat would dry everything out excessively but it didn’t. Shortly after I posted the no-shampoo method, I stopped letting it air dry and used the hair dryer instead, this enabled me to extend the time between washings by a few days. On the positive, prior to no ‘poo, I had to wash my hair every other day. After I stopped no ‘poo and switched back to shampoo and conditioner I’ve been able to only wash my hair every 3-4 days. This is amazing. A huge positive in my book. I’m still on the hunt for natural products to use instead of crap. I’m using Organix currently which I’ve decided is just as bad as Pantene or any of the others plus they green wash because there is nothing organic about their ingredients. I might have found a brand I’m happy with. A BWC shampoo was in my first Vegan Cuts beauty box and I really like it. As far as conditioner goes, some days I don’t use any and just do a pea to quarter-sized amount of argan or jojoba oil. My hair is about armpit length and medium thick. I used to use coconut oil but have found that it just makes my hair too greasy. Using a teeny bit didn’t cover enough hair and any extra turned it into a grease pit. Argan and jojoba oils are much lighter and leave my hair shiny but not weighed down. I usually don’t apply them near the scalp just mid-length and on the ends. Coconut oil may be more of a deep conditioning treatment versus daily use. Success!!! I have been using my homemade deodorant since the end of August and it’s just as amazing as the first time. During the warmer summer months it was very easy to just slip your finger in and grab a dab. Now that cooler fall weather has settled in the deodorant is noticeably firmer (this is due to the coconut oil) but I can still grab some with a little added pressure. You can also use a hairdryer to warm it up for about 10-20 seconds. Once you start applying it though, it melts like butter in your pits. It really is perfection. I’ve tried ones with shea butter in the past and those just clumped and fell out, they never rubbed in or absorbed easily. An added benefit is I’ve noticed the discoloring in my pits has gone away, in the past they were an orangish coral color in the ‘deodorant zone’. I wonder if that was because of the propylene glycol that’s in so many natural deodorants. I hope you’ve found this update helpful and encouraging on your journey to use healthier alternatives. I was no ‘poo for 1 year fairly successfully! I had hard water but I also had very short hair. The extra buildup or whatever gave me great powers to style my short hair – it was fabulous! When I started growing my hair out it became sticky at my scalp – in a gross way! I started alternating between shampoo and my baking soda mix until I just went to shampoo and conditioner about once a week. I now use shampoo about twice a week and often wear a shower cap to keep my hair dry just to avoid having to dry and style it so often. I’ll straighten the weird slept on parts and go, or just ponytail-up. 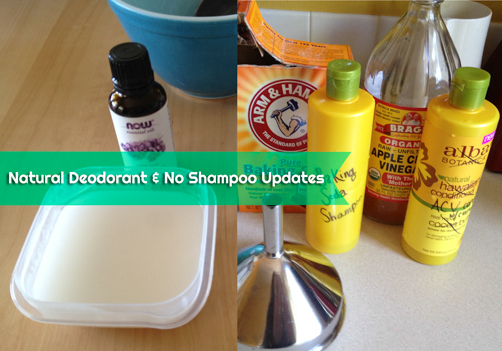 Your deodorant recipe rocks my world on a daily basis! Amazing!!! Since the cooler weather I’ve been using a tiny compostable spoon I got at an ice cream shop for taste testing and scrape off a tiny amount of deodorant, wipe it off with my finger and apply to my pits. It melts so nicely onto my skin and absorbs really well too. I was a little concerned about leaving oil stains on my clothes but that hasn’t been an issue either. Since quitting store bought deodorant and using home made the skin in my pits has gotten soften and smoother, even though the store bought stuff told me it would make me have gorgeous, presentable pits – they’re liars. Forgot to mention I’m using EO brand shampoo/conditioner and I’m really liking it. The coconut scent is really nice, even to a pregnant woman who thinks anything with a scent is gross. I’m so glad you posted an update on this because it reminds me to say thank you. I’m trying to reduce our packaging a la Zero Waste Home, so I tried your deodorant recipe. It’s so darned simple, and it works beautifully. I wish I had tried it years ago. I have also learned in the cooler weather to just use the back of my fingernail for scooping and applying (don’t scoop forward or it will get *under* your fingernail). Thank you again! Hi, I use an organic shampoo line from Target. It’s called Galvin & Galvin London, Kids. (I use the kids line because I have pretty bad allergies to most scents and these are mild enough that they don’t bother me). I use the Dubble Trubble shampoo, it doubles as a body soap as well. I also use their cucumber leave in detangling spray. I have thick naturally wavy long hair and I love both. Hi Brigitte, thanks for sharing. While I agree Lush has some beautiful smelling vegan shampoos and soaps (I’ve used their seanik while traveling) many of their products are very high in sodium lauryl sulphate and fake dies which many going the au natural route are looking to avoid. Hi. I have to thank you for sharing this deodorant recipe with all of us. It’s just amazing. When I was mixing the ingredients I was very reluctant to believe this would work but it does! I’m 24h odorless! I have made a second batch for my boyfriend but this time I used an empty deodorant container and it works ok for him too. I also want to share with you what I am using (and loving) as a shampoo replacement: shikakai. I hope you can find it because it’s somewhat rare. I buy it in an Indian store here in Spain.